Math word wall with definitions for 246 words that 3rd graders need. These meet CCSS standards but they're NOT tagged on the posters so they can be used in any district! You'll also get PowerPoint slideshows for the poster definitions. All 3rd grade math domains are included in this all-inclusive set of math words. This is a bundled set of 5 full products designed to improve math vocabulary skills. 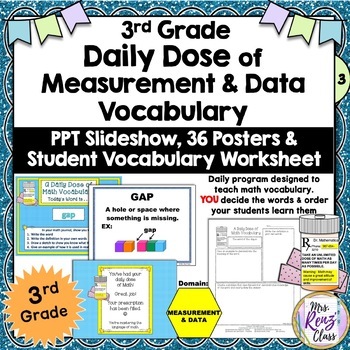 The set includes 5 math vocabulary PowerPoint “Daily Dose of Math Vocabulary” slideshows plus word wall posters with a daily student activity. As of Aug. 2016, there's 602 pages of materials in this year-long bundled set! You will receive 5 PowerPoint slide shows with a total of 323 PPT slides. There are 246 CCSS-M math posters for your math word wall and 33 pages of student and teacher materials. Be sure to download the 13-page product preview to see everything included. The yearlong bundled set saves money over buying the domain sets individually. These slideshow and poster sets help students learn the language of math and are a great daily morning starter activity if you choose to use them that way. 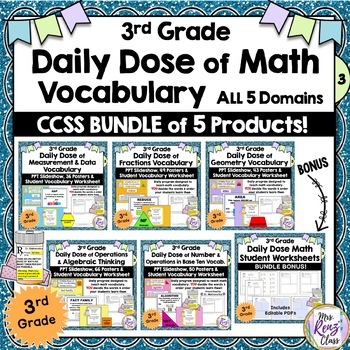 Dr. Mathematica has prescribed “A Daily Dose of Math Vocabulary” to help out! 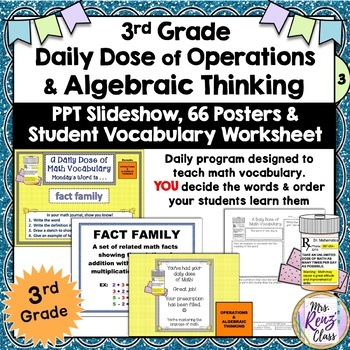 This program includes a PowerPoint slideshow, poster set, and student activity that gives students a “prescription” for daily math vocabulary practice to help them become more capable in math. There are two colorful slideshow formats to choose from: “Today’s word is…” or there’s the version that lists the word by the day of the week (Monday’s word is… , Tuesday’s word is…etc). The daily dose prescription comes with a warning: Math may cause a great attitude and improvement of skills! ☺ Students’ daily dose prescription is filled once the daily activity is completed. This set is totally aligned to the Common Core Math Geometry domain and there are extra words included to help build and extend math knowledge. All words in the set are listed alphabetically and include standard numbers to make it easy for you to manage. Teachers will decide which words students know, and which words they need to study for their daily dose. Students will view three slides each day; the title slide (with the focus word and journal prompts), the word slide (with definition in kid friendly language, and a visual and/or example), and there’s an ending slide. Students will write the word, give the definition, and write an example or problem demonstrating knowledge (teachers can customize these directions with the editable PDFs). The slideshows are designed to be quick and easy for you to manage. Just move the slide in between the day’s beginning and ending slide and type the word of the day into the box. That’s it! Save and be ready for the whole week of word work. Teachers will decide what words need revision or review and which they’ve mastered and will slide them into position behind the red (stop and relearn) or green (go on and learn other words) slides. This is super easy to use and keep track of the words you’ve studied. At the end of the year, just re-alphabetize the slides in the slide sorter view and you’re ready for the new school year of math vocabulary studies. Student activity sheets included with several options: Full page and half page sizes, and with questions prompts and without. These are in both PDF and editable WORD formats. Also included are “My Daily Dose of Math Vocabulary” math journal stickers/labels (2 x 4 inch). Included in the set for both sheet sizes are super cool EDITABLE PDFs! You just click into the cell and type what you want the worksheet to say and customize the worksheets. Directions are included to show you how these editable PDFs work. I am so excited to offer these to you! 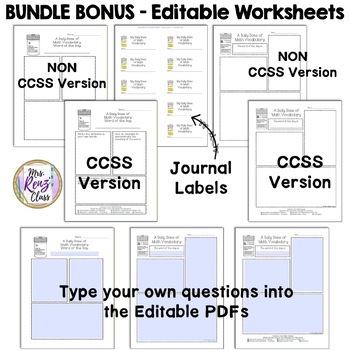 The teacher materials include a listing of CCSS-M domain words listed alphabetically with standard code numbers, a nicely organized set of the full CCSS-M standards for your planning binder, and complete directions with screenshots to help you maximize your use of the set. All of the full screen size vocabulary slides are provided in PDF format so you can post them to your math word wall. The posters are designed to be readable from across the room and give the word, definition, an example and/or visual. Addend, arithmetic pattern, array, Associative Property + and x, Commutative Property x, consecutive, decrease, deduct, decompose, descending, difference, digit, Distributive Property, divide / division, equation, estimate, evaluate, even, expression, fact family, factor, is not equal, multiply, odd, operation, order of operations, palindrome, parentheses, partition, pattern, product, property, quantity, quotient, reasonable / reasonableness, regroup, related, facts, remainder, round, rounding, sequence, square number, strategy, symbol, value, variable, whole number, Zero Property of x.
add/addition, algorithm, compose, dec- /deci- (decagon, decahedron, decade, decathlon, decimal, deciliter, decimeter), decimal, decimal point, digit, dividend, divisible, divisor, expanded form, multiple, multiply/multiplication, number sense, numeral, operation, period, place value, Roman Numerals, round/rounding, skip count, standard form, subtract, whole number, word form. Algorithm, common denominator, compare, denominator, eighth, endpoint, equal/equals/equally, equivalent/equivalence, equivalent fraction, fifth, fourth, fraction, fraction model, greater than, half/halves, interval, length, less than, multiple, number line, numerator, partition, point, quantity, reduce, sixth, symbol, tenth, third, twelfths, whole number. A.M., add, area, area model, ascending, attribute, bar graph, centi- (centigrade, centigram, centiliter, centimeter), centimeter, clockwise, column, counterclockwise, customary system, data, decompose, descending, dimension, distributive property, divide/division, elapsed time, estimate/estimation, foot, formula, fourth, gallon-quart-pint-cup, gram, half/halves, half hour, height, horizontal, hour, inch, inch-foot-yard, increase, interval, kilo- (kilogram, kiloliter, kilometer), kilogram, length, line plot, liter, mass, maximum, meter, metric system (length, capacity, mass temperature), minute, mile, milli- (milligram, milliliter, millimeter, million), millimeter, minimum, MPG/MPH, multiply/multiplication, number line, operation, ounce, perimeter, picture graph, plane figure, P.M., polygon, product, property, quarter, rectangle, rectangular, rectilinear figure, row, scaled graph, set, side, square, square unit, subtract, sum, tiling, time interval, unit, unit square, unit fraction, Venn diagram, vertical, volume (liquid),whole number, width, yard. Area, attribute, classify, cone, diagonal, exterior, fraction, hexagon, interior, line, line of symmetry, line segment, parallel lines, parallelogram, partition, pentagon, point, polygon, quadrilateral, rectangle, rectangular, rectilinear figure, rhombus, side, solid, sphere, square, symmetry, tessellation, three dimensional figure (3-D), tiling, trapezoid, triangle (2 posters), two dimensional figure (2-D), unit fraction. Enjoy your daily dose of math vocabulary!